On September 4, the Syrian army and Hezbollah, supported by the Russian Aerospace Forces, have expelled Al Nusra Front terrorists and their allies from the Armament College and the Artillery College and nearby buildings at the Ramouseh Artillery Base in southwestern Aleppo. 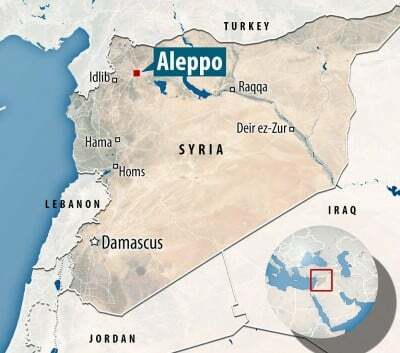 This move allowed the pro-government forces to set a full control of the road between Khan Tuman and the Ramouseh Neigborhood and besiege the militant-controlled areas of Aleppo city for the second time this summer. In turn, Al Nusra terrorists, supported by other groups of the Jaish al-Fateh operation room, launched a counterattack in order to regain positions in the artillery base. By September 5, the pro-government forces have repelled the terrorists’ counter-attacks and now are securing the area. The Russian Aerospace Forces made 75 air strikes on terrorist targets in southwestern Aleppo on September 4 and already made some 30 air strikes on September 5, supporting the pro-government forces there. Pro-government forces report that Al Nusra and its allies have lost from 100 to 200 fighters in these clashes. The Syrian army and its allies will likely continue their advance, attacking the Hikma School and the northern part of 1070 Apartment Project. Then, they will likely advance in the Ramouseh Neighborhood. These moves will allow the Syrian government to control successfully the perimeter of the besieged militant-controlled areas. The Iraqi pro-government militia “Haraket al-Nujba” has captured of the Khan Tuman depots near the strategic town of Khan Tuman in southern Aleppo and the pro-government forces have seized the town of Qarassi. These will allow them to develop advance on the strategic town of Khan Tuman in southern Aleppo. The Turkish-led forces in Syria have taken control of the 91km border between Azaz and Jarabulus, wiping out the ISIS terrorist group from the area. Turkey’s Prime Minister Binali Yildirim announced on September 5 that Turkish Armed Forces and Turkish-backed militants had successfully expelled “terrorist organizations” from the area. After securing the borderline between two strategic strongholds of Azaz and Jarabulus, the Turkey-led forces will likely advance on the ISIS-controlled logistical hub of Al-Bab. This will allow them to destroy the last hopes of the Kurdish People’s Protection Units (YPG) to link the YPG-controlled areas in northern Syria. 2 Syrian soldiers were killed and 7 others wounded when a car bomb targeted the Bab Tadmor checkpoint at the entrance of al-Zahraa neighbourhood of Homs. The attack followed a failed joint offensive of Jund Al-Aqsa, Faylaq Al-Sham and the Free Syrian Army on the government-controlled town of Kawkab in the province of Hama. The Syrian army and Hezbollah killed over 30 terrorists and sestroyed 2 tanks and 2 BMPs in the clashes there. 4 battle tanks, 2 BMPs, and 5 vehicles with machine guns were reportedly seized by the pro-government forces. The situation in the province remains tense. Recently, the loyalists have taken back Khirbat al-Hajamah and the Samsam hill and now are in control of a part of Ma’arda. Clashes are ongoing.